If you haven’t read the Introduction to HTML5 yet, go ahead and read that. I’ll still be here when you get back! If you’ve chosen your text editor, power it up straight away. Got it? Great! If you’re totally new to coding, then don’t be daunted as I’ll go down it pretty much line-by-line. If you’ve never coded before, then you should be grateful for this line. The first line of a HTML document used to be more complicated than this, but since the introduction of HTML5 it was made simpler. This line tells your browser what kind of page this is, or more accurately, what type of document it is (see, DOCTYPE!). And the document type is html. This HTML Tag does not have a closing tag – i.e. there is no </doctype> to put at the end of your code. The only thing you need to know is by putting this at the start of the document, you are telling the browser that it is a HTML5 compliant page. The <html> tag (along with the </html> closing tag) contain everything about your page in between them. It is a good idea to get into a healthy routine now. If your tags should have a closing tag, then type your opening and closing HTML tags first. Then go ahead and put stuff between them. Tags which have not been closed can often make your whole page mess up and makes finding why they have messed up much harder. So you can see in this example that all the other tags, except <!DOCTYPE html> are between your <html> </html> tags. Next we have the <head> </head> tag pair. and other files which give your page extra functionality. There are more items which can appear in the <head> section, but that’s a good start. When done correctly, none of these things themselves appear on the page, although they might dictate how that is presented. When choosing your <title> you should keep it short but descriptive. And if you want to include your site name in the title tag, put it after the page description. e.g. Technically, for search engine presentation there is a pixel limit, but if you keep it under 58 characters you should be fine. I’ll cover other head tags in a later tutorial. These tags can be found inside your <head>, or to improve page speed may be found just before the </body> tag. In time this site will bring in CSS (Cascading Style Sheets). Stylesheets govern how different tags and features are displayed in a browser. By having one stylesheet for your whole site, you can create a consistent look and feel on all your pages. Stylesheets are also the primary way of building a mobile-friendly (responsive) website. Lines 10-11: The <style> </style> tags are for page-specific layout rules One one hand this can speed up your page load time (because you’re not loading rules from another file) but external files get cached, increasing the load time of subsequent pages visited by your users. However, there may be occasions where certain layout rules only apply to specific pages, so you can use this tag pair for that. Line 12: The <link> tag (which does not have a </link> tag) is used to pull in certain external files, most commonly CSS stored in an external file. If this tag is on all your pages, then the same layout rules will be applied across your whole website. The simplest way to consider this is that, everything found between <body> and </body> is what will be displayed in a browser when someone loads your website. Although you might find <script> </script> tags occasionally, this should be rare. The main exception to this rule is when you want to speed up your website’s page load time, you can move these to just before the </body> tag, but you’ll need to make sure that the rendering of your page does not depend on these Scripts first. The vast majority of your coding will be focussed on what is found between the two BODY tags. Not to be confused with the <head> tag, the header tag determines what appears at the top of your site. It can also be used to denote the ‘header’ of something else. So say you have a list of new blog posts, you might use the header on each of your post summaries. But for the purposes of these tutorials, for now, assume this is to do with the top of your page. 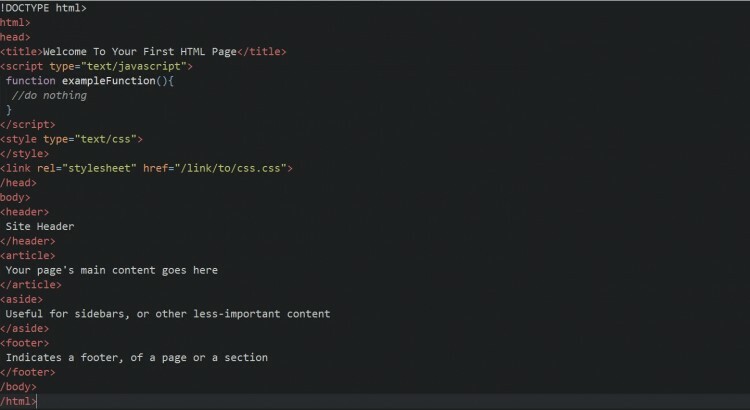 In short, see the <header> as part of a template – what will appear at the top of every page. Whether this is for a blog post or just a ‘content page’, your main page text and images go in here. The contains the stuff relevant for this page specifically. Less important information can go in the <aside> </aside> tag pair. This could be used for anything really from related pages, interesting additional information, or for a sidebar across the whole site. Just bear in mind that anything in your aside will be treated as a less important that the content in your <article> </article> tags. An you’ve reached the last element in our example, well done! The </footer> </footer> tag pair can be used as a ‘template tag’ – i.e. stuff you want to appear at the bottom of every page. What you put in your footer is up to you, but it’s usually helpful to have some key page links in there. This is so when people have scrolled or swiped to the bottom of your page, they have somewhere to go, rather than forcing them to return to the top of your page to browse more pages. 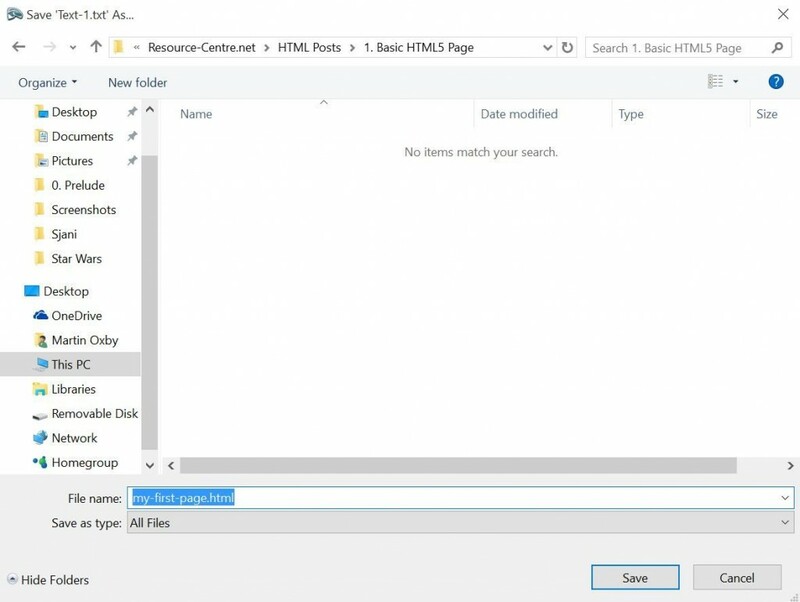 Now you’ve got your first lines of HTML5 put in, you need to go ahead and save that file. Depending on your text editor, you may need to specify the file extension (the letters/numbers after the dot in the file name). For a simple HTML5 file, you can give it the extension of .htm or .html. Save this anywhere on your computer, but remember where you have saved it. It might not look that impressive, but you’ve taken your first steps in creating a web page. Now go treat yourself to something!